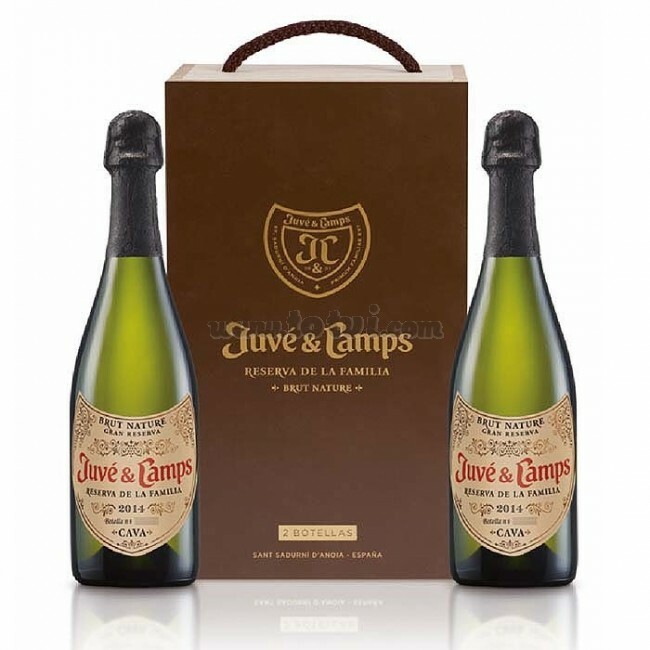 Wooden box with breadcloth for 2 bottles of Juvé and Camps Reserva de la Familia Brut Nature is a cava made from the flower must of Macabeo, Xarel·lo and Parellada grapes, harvested in the estates of Espiells, Can Massana and La Cuscona. An intense and elegant cava that evokes notes of ripe white fruit. The palate is creamy, fresh and broad. A great cava that will not leave you indifferent. 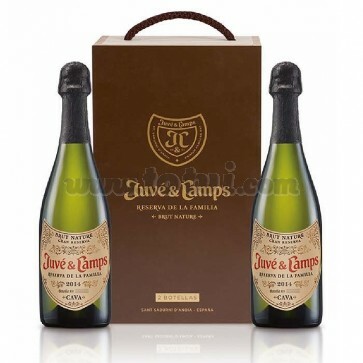 Wooden box with breadcloth for 2 bottles of Juvé and Camps Reserva de la Familia Brut Nature is a cava made from the must of Macabeo grapes (35%), Xarel·lo (55%) and Parellada (10%), harvested in the estates of Espiells, Can Massana and La Cuscona. Bright and attractive pale golden color. Their tiny and abundant bubbles, ascend forming numerous rosaries and a stable crown. Deep, intense and elegant, it initially evokes notes of ripe white fruits. Little by little, its complexity grows and the aromas of a long aging appear. Memories of toasted bread and a certain citrus background complete its distinguished aroma. The creaminess of its foam is perfectly integrated into the palate, making its passage through the mouth simultaneously fresh, wide and suggestive. All the aromas that are perceived in the glass are exhibited in its long final. It ages for 36 months.